Follow Us For Our Boat Tips! Repair Companies Near Vancouver BC? Stay Warm On Your Boat. 4 Tips On Marine Diesel Heaters. The Vancouver Aquarium operates a 27' Seasport power boat to support its research of marine mammals living in the coastal waters of BC. Getting access to the marine environment that's home to orcas, dolphins, sea otters and other mammals requires a boat with speed and torque and that operates as quietly as possible. The research vessel Skana had been operating for several years with a Volvo D4 260 (260 horse power) equipped with a DPH stern drive. The boat's cruising speed was 19 knots, the engine weighed 1230 lbs, and the research team required the cabin door to be closed to carry on conversations. 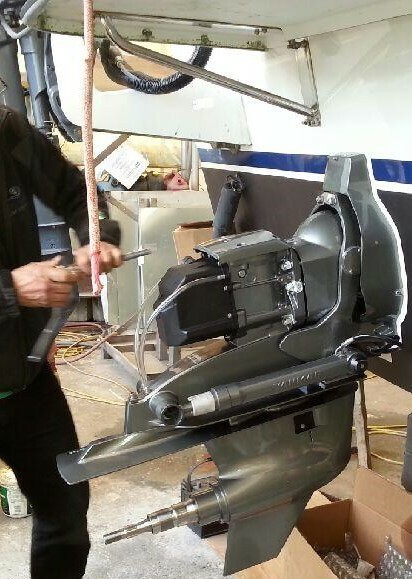 Explorer worked with Aquarium leadership to repower the boat with a Yanmar 8LV-350Z diesel engine equipped with a Yanmar ZT370E stern drive. Explorer installed a digital control station in the main helm and one on the flybridge. During sea trials the new 350 horse power Yanmar propulsion system increased Skana's cruising speed to 28 knots, added a significant increase in torque and decreased the weight of the boat by over 250 lbs. The Yanmar engine is significantly quieter and allows the cabin door to be left open during operation. Yanmar's ZT370 stern drive is designed with a hydraulic clutch for smoother and quieter shifting, so the whales should be happy too. "I must say I'm impressed with the quality of all the work done so far and very appreciative of the thought that went into the project. Craig is awesome, as is the fiberglasser - you've got a great crew!" Every month Explorer publishes a monthly e-mail newsletter with great deals and maintenance tips for your boat. Subscribe here to receive your copy!